I love surfing and i have been to many surfing sports in Europe but last January, the coldest month in Sweden where I booked a trip to the sun for some surfing. Little did I know that I was about to go and find my new favorite place in the world, Byron bay. Australia really has surfing in its core, especially the Gold Coast. At the Gold Coast you have many options for surfing, there are many camps offering you different things. You have one, Mojo surf camp that takes you from Sydney to Byron bay and you surf at different locations as you travel the country. There are camps in almost every city in the Gold Coast but if I could give advise I say take on off the camps that are stated in Byron Bay. Byron Bay is the coolest, loveliest and most awesome town that gives you all you need when it comes to surfing. Not only perfect conditions for surfing but you are in a town that breaths and lives surfing. You walk into town and you are surrounded by surfing in everyway possible and you get a chance to really try the surfing lifestyle. 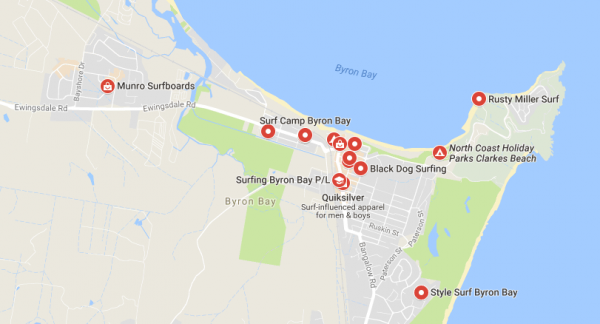 You have several options when it comes to surf camps, i myself was at Surf Camp Byron Bay, but there are others like Byron Bay soul surf, backpackers in, Byron bay surf school, black dog surfing among many others. What you get with them is you pick the amount off days you want to surf for and in the price accommodation is included. You can pick anything from 1 day to a month long stays. I booked 10 days at the surf camp, because I really wanted to get a feel for the lifestyle. We had surfing lessons everyday for three hours after that it was time to chill. The hostel I was staying at had a backyard with everything you needed for a afternoon off fun, games, volleyball, pool, food truck and a lot off sunbeds and hammocks. In the evening you would stroll down to town and one off the many restaurants for dinner. That was one thing that really surprised me, that such a small town had so many food options. They have everything you can imagine several amazing pizza places, hamburger bars, healthy food places. By the time was up i had really gotten a chance to try the surfer life and was more then ready to leave for the next destination off my adventure in Australia. About the author: Sara has a life long passion for traveling and adventures. Her moto in life is make money and spend it on traveling the world. She also love to help you out with tips on how to make your trips the best you ever had. Make sure to follow her site tripsbysara.wordpress.com.